It is often one thing to have a court order a parent to pay child support, and quite another to have the parent make the ordered payments. Some parents opt not to pay child support, and may take steps to ensure that the other parent does not receive the ordered amount. These steps may include quitting a job, or getting paid off the books. For a parent who refuses or fails to pay child support, and has a steady job, enforcement of a child support order can be forced through wage garnishment. Wage garnishment is the process through which a court orders a person’s employer to withhold a portion of the person’s employment check in order to pay for a debt, in this case child support payments. The withheld money is then sent to the parent who was supposed to receive the money in the first place. Wage garnishments are allowed in Florida; however, there is a limit on the percentage of a person’s income that can be garnished to satisfy a child support order. A court order permitting garnishment is required to be entered at the same time as the order for child support. This makes it easier for a parent to enforce the child support order without having to return to court to ask a court for an order to enforce a child support order. Even when a person does not expect a parent who is ordered to pay child support to fail to pay, it is important to have an enforcement order in place. Orders allowing for wage garnishment, or income deduction, must be drafted very carefully in order to meet the requirements of the law allowing garnishment. If the order is not properly drafted, it may delay the deductions, or keep an employer from garnishing an employee’s wages. The parent seeking the wage garnishment may have to return to court to seek a corrected garnishment order, which may take time and be expensive. If a person fails to pay court ordered child support payments his tax returns and any lottery winnings can also be withheld in order to pay for child support. A person’s driver’s license, and business or professional license may also be suspended until the person gets current on his child support obligation. 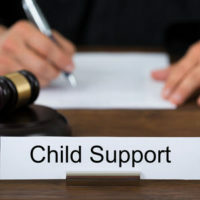 There are additional steps that can be taken to force someone to pay a child support order. A person’s obligation to pay child support does not end even after the child reaches the age of eighteen. If a parent has failed to pay child support for a long time, the arrears will include interest payments, and has to be paid even though no new child support payments are added. Therefore, these forms of enforcement may be viable for a long time after the original order is entered. Child support can be extremely helpful to you if you are a parent who is primarily raising a child alone. If you were awarded child support but have not received any payments from the other parent, you have options for enforcing the order. For more information on how you can enforce a child support order, contact our experienced child support lawyers at the Law Offices of Schwartz | White in Boca Raton, Florida.